Sometimes we take life for granted. We don't realize how lucky we may be for our health and our strength. We don't appreciate having very few, or even a small stack, of doctor's bills. 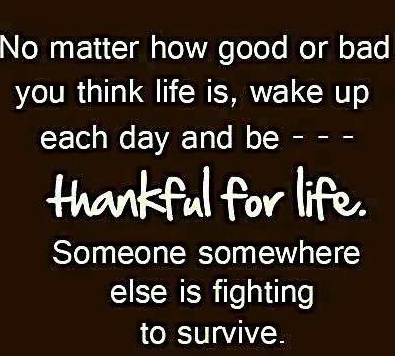 And while we may not even realize it, someone is grateful for another day of living. They are grateful they woke up this morning and can see the sun shine. We must be grateful for each day that we are alive. As this quote reminds us, no matter how good or bad your life is, wake up and be thankful for life. Be grateful each day for what you have been given and the blessings you enjoy.